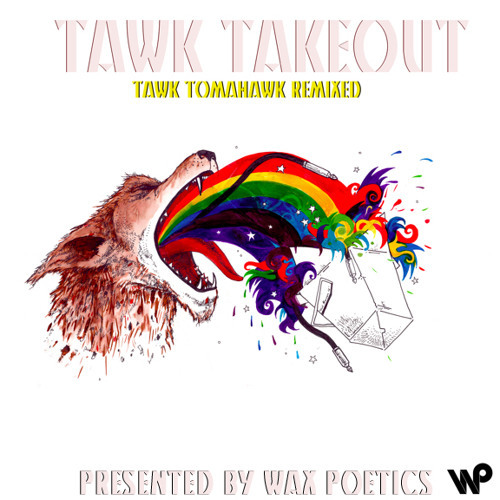 <b>Wax Poetics Presents "Tawk Takeout: Tawk Tomahawk Remixed" by Melbourne, Australia soul group Hiatus Kaiyote.</b> When Queen of Just About Everything, Ms. Erykah Badu, delivers knowledge, you open yourself to receive. Which is why when she devoted 140 characters or less to Australian band Hiatus Kaiyote—her exact words were "Okay. I'm done. In love,"—it confirmed our strong sense that these guys were exceptionally special. In a country where balls-to-the-floor AC/DC rock boasts a much fuller history than soulfully futuristic stylings, this seven-piece from the east coast city of Melbourne is an anomaly. Hiatus Kaiyote’s uniqueness comes not only from their surroundings, but also their capacity for a sound rich in its understanding of soul, R&amp;B, and jazz. Lead singer/songwriter Nai Palm was raised on the sincerity of artists like Wonder and Franklin, which she funnels into one of the most naturally arresting voices we’ve heard (check this <a href="http://youtu.be/FwLU_PXheuo" target="_blank">cover of "My Cherie Amor"</a> from her NYC debut over the weekend). Her current U.S. trip as ambassador for the band has gained Hiatus Kaiyote a luminary list of new fans and friends including the Roots, Miguel Atwood-Ferguson, Jean Grae, Pharoahe Monch, the Brainfeeder crew, and more. Word of Hiatus Kaiyote has found its way to the U.K. as well. Right now the band is enjoying the attention of Gilles Peterson, who selected their self-released EP <em>Tawk Tomahawk</em> as his Album of the Week. The timing has worked well for us too, as Wax Poetics cordially presents the accompanying remix album<em>, Tawk Takeout</em>. Twelve producers tackle Hiatus Kaiyote originals, grappling with the stems and unfolding them into various forms. Mark de Clive-Lowe contributes a wonderfully spirited version of "Malika," which sits beside interpretations by Shafiq Husayn, KCRW’s Anthony Valadez, and more. Listen to the album in full above, and <a href="http://hiatuskaiyote.bandcamp.com/album/tawk-takeout" target="_blank">download it for free</a> via Hiatus Kaiyote’s Bandcamp page. Users who like Hiatus Kaiyote "Tawk Takeout: Tawk Tomahawk Remixed"
Users who reposted Hiatus Kaiyote "Tawk Takeout: Tawk Tomahawk Remixed"